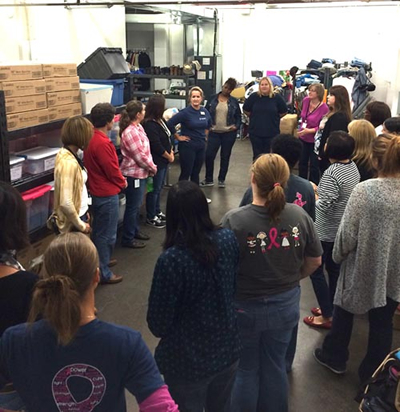 On Tuesday, October 13, the Women@Teva Employee Resource Group's Community Outreach team had their first event at Lighthouse Youth Services and The Sheakley Center in Cincinnati, Ohio. Nineteen women volunteered their time to serve homeless young adults. Lighthouse Youth Services, one of Teva's Community Partners, is a multiservice agency providing social services, including behavioral and mental health, to children, youth and families in southeastern Ohio, and The Sheakley Center is dedicated to helping runaway and homeless youth. The Sheakley Center is one of only three homeless shelters in the country that provide a variety of services to young adults ages 18-24. The Women@Teva Community Outreach team also spearheaded a “Hygiene Drive" at Teva's Cincinnati site and collected 6 large boxes of personal care items that were donated to Lighthouse to distribute to the homeless community in Cincinnati. On the day of the volunteering event, the nineteen Women@Teva volunteers were met by a Lighthouse employee, who led the volunteers to a warehouse so they could unpack and sort the Hygiene Drive donations. She showed the Teva women around the warehouse and shared heartbreaking stories of families that needed help due to homelessness. Many 18-year-olds become homeless because that's the age that state financial assistance ceases for foster kids/families. At The Sheakley Center, the Women@Teva volunteers helped to serve lunch, and had even brought some Halloween decorations for the cafeteria. As the residents came down for lunch, the volunteers served the residents lunch and chatted with them. They talked about all kinds of things, especially finding a job, which is a major focus of The Sheakley Center. It's a top priority for all residents. After lunch, the Women@Teva team headed back to the Lighthouse building for a wrap-up, and the most frequent question from the nineteen women was “When can we do this again?" It was an incredible event, and Teva has honored to be able to support this worthy organization.